BRACELET - SARAH COVENTRY. "CLEOPATRA" FROM 1972. 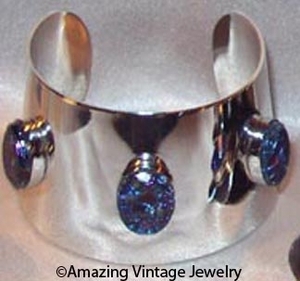 WIDE, SHAPED BRIGHT SILVERTONE CUFF WITH GLITTERING BLUE/PURPLE INSETS. 1 11/16" WIDE, FITS MOST WRISTS. VERY GOOD CONDITION.